The 80/20 tool shows you big insights and invisible opportunities based on small amounts of information. 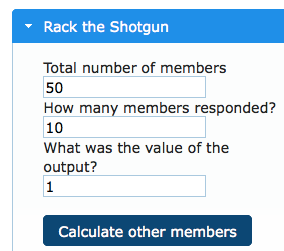 "Rack The Shotgun" story: In a noisy club in Las Vegas, a professional gambler pulled a sawed-off shotgun out of his jacket, racked it, and looked around to see who recognized the ratcheting sound and turned their heads. He said to his protege, "John, the people who turned their heads are not marks. Do not play poker with them. Gamble with everybody else." Every time you ask an audience to do anything - and some people respond and some don't - you're Racking The Shotgun. Everything you do in marketing racks the shotgun. 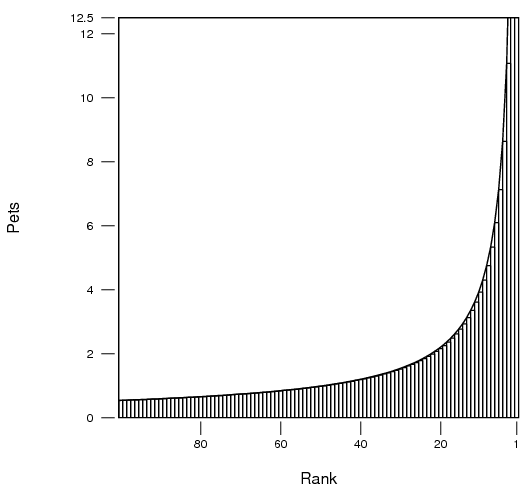 The 80/20 Curve predicts the future responsiveness of everyone who responded the first time. In this example, the value of a response is arbitrary. We just picked "1". 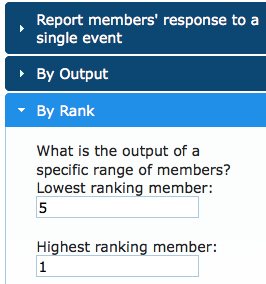 Notice that in the graph the least responsive person was a "1" and the most response was a "7." That means the most shotgun-sensitive person in the room was probably 7 times more alarmed by that sound than the least responsive one. 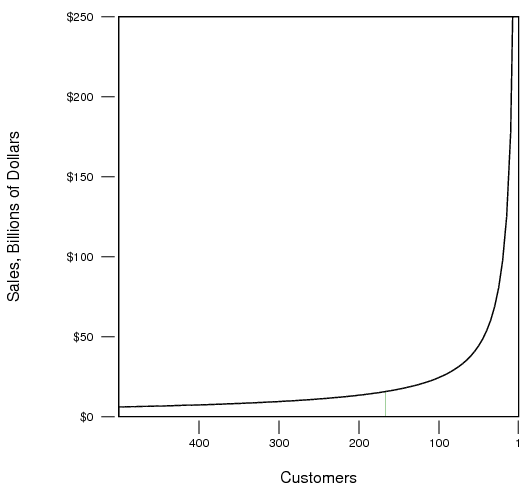 Business Example: If 50 people spent $100, how many would spend $500? 1000 people visit your website. 50 buy a $100 product. How much money are all the buyers actually willing to spend? Most of the people who bought have more capacity to buy than you tapped. Some have a lot more. This does not mean they will pay $400 for a $100 product (though a few might). What it means is, if you offer the same audience a product worth $400, 10 can and will buy it. 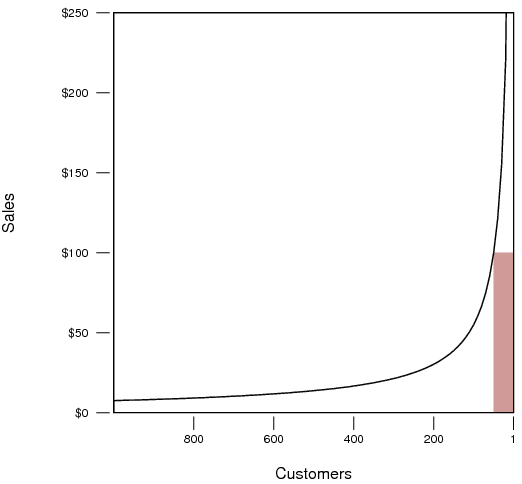 Note that we specified the label "Sales, Billions of Dollars" using the custom label tool below the graph. 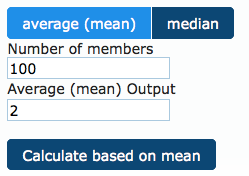 The tool uses 80/20 to estimate the size of every other Fortune 500 company. If you click on the other tabs and look in the fields there, you will also see that it has estimated the total revenues of all Fortune 500 companies and the mean and median sizes of those companies. From this you can even extrapolate the numbers of companies and their sizes of all the companies in the world. You see a statistic in the newspaper like "The average family owns 2 pets" and you want to know what percentage of families have one pet, and how many have ten. If you mouse over the #1 person, you see that they have 28 pets. 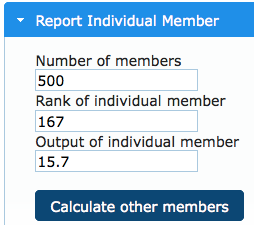 Person #100 has 0.54 pets. Anyone with less than 1 pet has zero. An article in the newspaper says, "The median household income in California is $57,287." 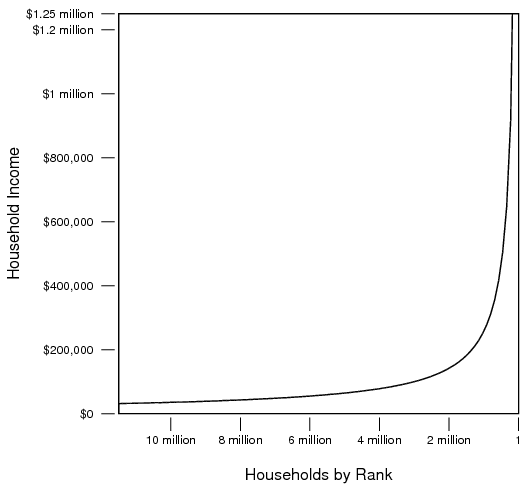 You want to see how many families are at other income levels. You find out there are 11.5 million households in California. ACME corporation has 100 dealers and total sales through the dealer network last year was $10 million. 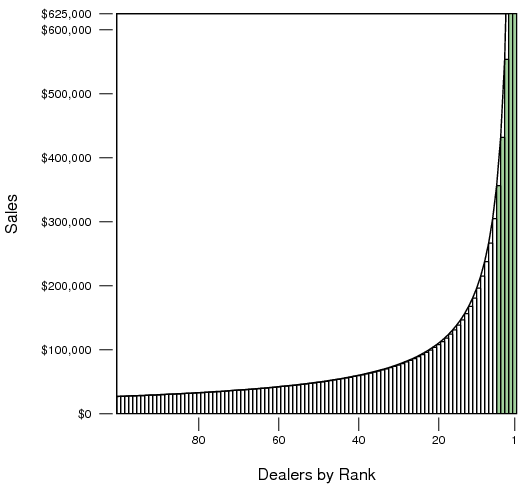 How much did each dealer sell? 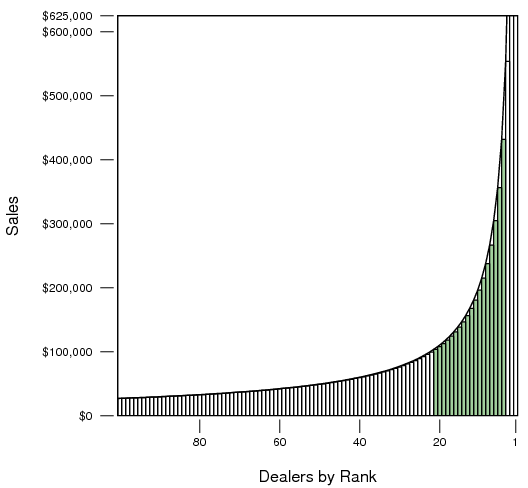 How many dealers sold between $100,000 and $500,000? 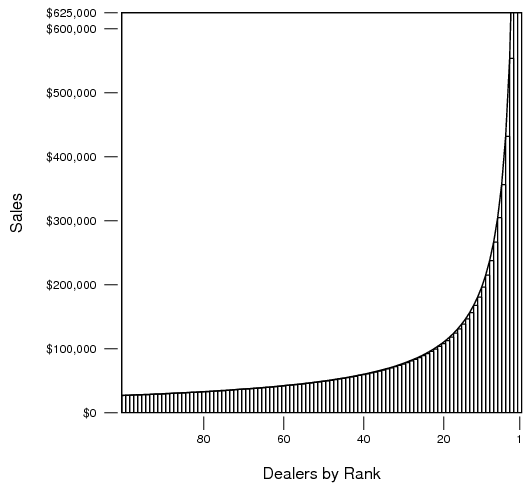 What is the sales of the #1 dealer? 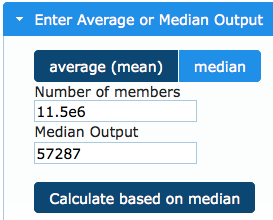 You can mouse over his bar, or go to "Examine a Range of Members - By Output" and enter "1". You find the number is $1.426 million. 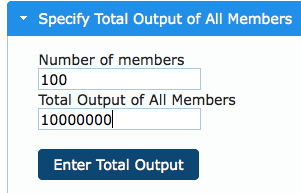 "Members 5 through 1 can produce $356,500 to $1.426 million each, with a total output of $3.553 million"
Q: A lot of things I calculate don’t quite seem to be 80/20 even though you say they’re supposed to be. For example if I enter 100 sales people and their total sales is 1 million dollars, when I “Examine a Range of Members,” it predicts the top 20 will sell $615,000 and the bottom 80 will sell $385,000. That’s not 80/20, it’s more like 60/40. 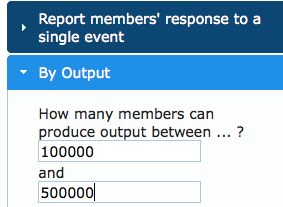 A: That’s because you are dealing with a finite number of members (sales people). 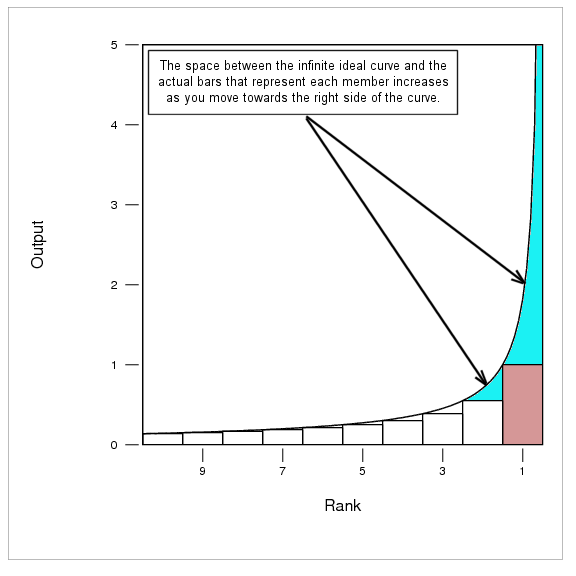 The space between the infinite ideal curve and the actual bars that represent each member increases as you move towards the right side of the curve. The more sales people you have, the closer they as a group will resemble 80/20. If you have 1,000 sales people or 10,000 sales people, the more perfectly reality will resemble the ideal. The opposite is also true. If you have 5 sales people, the tool predicts four of them will sell 63% and one of them will sell 42%. The top one still sells 4X more than the bottom one, so the inequality is still there. Remember, this is just a prediction of what is typical. It is of course possible to hire 5 sales people and one of them happens to be absolutely amazing; but the odds are against that. The more sales people you hire the more inevitable it will be that one is a superstar. 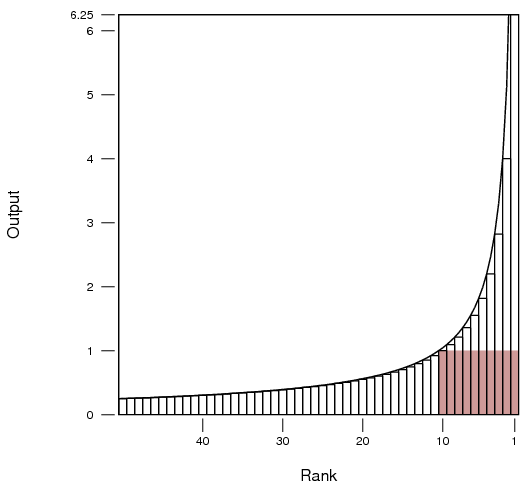 The 80/20 curve predicts what’s most likely to happen.